While Mg2+ deficiency can cause leg cramps it is in practice rarely the main culprit, dehydration & a lack of salt are more common (Schwellnus. 2008). If you look at the available literature, most studies suggest that magnesium supplementation can be beneficial if the subjects don't get enough magnesium in their diets. For most athletes, however, this is not the case (Lukaski. 1995). That's in contrast to the American Average Joe, as you've learned recently in my article about "Prevalent Nutrient Deficiencies in the US" (read more). Still, some studies have shown that Mg 2+ may have a positive effect on sporting performance (Lukaski, Bolonchuk, Klevay, Milne & Sandstead, 1983; Brilla & Haley, 1992; Brilla & Gunter, 1995). Oftentimes however without previously determining whether the subjects had low magnesium levels. "reported that there was a significant increase in time to fatigue when Mg2+ was compared to placebo. This may suggest that Mg 2+ is effective in increasing the time to fatigue on a leg dynamometer. [However,] Brilla and Gunter (1995) failed to provide subjects with a washout period between interventions which may have had a negative effect on recorded results as levels of Mg2+ may not have returned to baseline level for the group experiencing placebo as their second intervention" (Pitkin. 2014). Now, that's old news. What's really interesting, though, are the results of Pitkin's very own study that was determined to determine if there is a significant effect on blood pressure, serum levels of magnesium and sports performance including 1RM and 10 kilometre running time trial following Magnesium (Mg2+) supplementation over a five week intervention period in recreationally active athletes when compared to a 5 week placebo intervention. "Subjects participated in a 14 week protocol which employed a randomized blind cross over controlled design. Fifteen subjects were initially screened and accepted for participation. During the protocol two subjects dropped out, failing to complete. This left nine male and four female subjects who were successful in completing the protocol (Age: 24.85 ± 6.49 years, Height: 175cm ± 10.34 cm, Weight: 71 .9 Kg ± 11.46 Kg)" (Piktin. 2014). The design of the study involved the participants completing the protocol a total of four times over a fourteen week period. Participants were tested initially as a baseline measurement. Subjects were then provided with supplementation, either 500mg/day of placebo or magnesium which was picked at random, resulting in 8 subjects initially consuming placebo and 5 subjects consuming Mg2+. Table 2: Overview of the study design (Piktin. 2014). 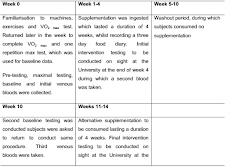 "After the four week supplementation period participants returned to the University to have post intervention testing conducted. 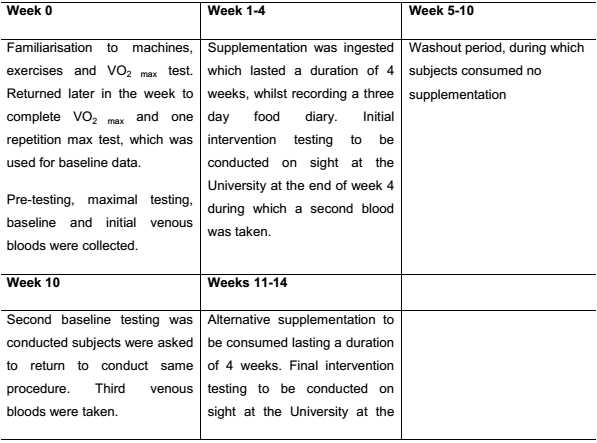 Following this, participants had a five week washout period aiming to reduce any potential performance gains attained from the intervention and bring subjects back to baseline levels. After the washout period participants returned for a third time to complete a second set of baseline testing, participants were then presented with their second intervention" (Pitkin. 2014). The study used a cross-over design, which means that both subjects took the MG or placebo supplement for 4 weeks. In view of the low number of participants this is a major advantage which makes the results that were evaluated at the end of the two supplementation phases that were interspersed with a wash-out period more reliable. Speaking of results: One of the results that is very important was actually observed at baseline already. 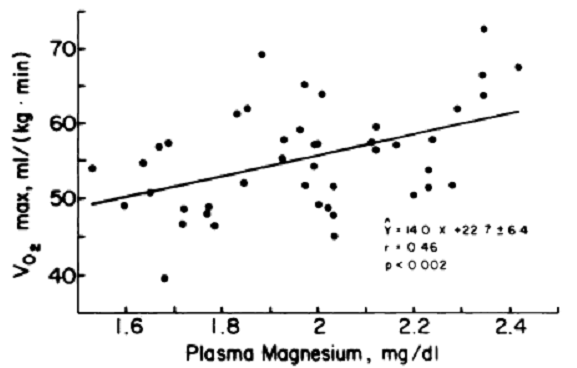 As the data in Figure 2 indicates, The mean plasma Mg2+ level at baseline was 0.71 mmol/L, this is below the mean serum concentration in humans, which has been suggested to be roughly 0.85 mmol/L (Wacker. 1980). The low magnesium levels are particularly interesting, because the value did not increase into the "normal" range over the course of the supplementation phase. This puts a huge "?" behind the assumption that magnesium intakes that would be normal for Average Joe's are sufficient for athletic individuals. On the other hand, the mean Mg2+ intakes of the subjects were 274.77mg ± 113.15mg/day for the male and 251.25mg ± 47.39mg/day for the female participants and thus not exactly as high as one would like to see them (380mg+). In spite of that, scientists have long suspected that endurance trainees in particular would have an increased need for Mg2+ due to its catabolism as a consequence of to the high habitual daily rates of energy expenditure (Terblanche et al., 1992). Convincing evidence that this is actually the case is however still lacking - specifically because the loss of magnesium in sweat has often been extremely overestimated. Even the small increase of 0.02 (3.7%) mmol/L that was also seen over the course of the Mg 2+ supplementation was yet sufficient to trigger an average decrease in 10K completion time of exactly 1 minute (1.77%) - a performance advantage with both statistical and real world significance, which went hand in hand with lower heart rates during the 10k run in the MG vs. placebo group (normally you would expect higher heart rates with increased performance if the magnesium supplement did not improve the work efficacy of the heart). 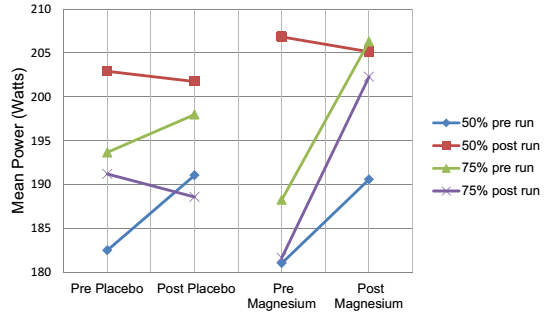 Figure 3: Changes in mean power during the bench press test at different % of the 1-RM before and after the 10k-run during the placebo and magnesium supplementation phase (Pitkin. 2014). Hand in hand with the increased time trial performance came the increases in mean power before on the bench that were observed in all trials except the mean power 50% post run (see Figure 3). Just like the increases in peak performance on the bench (not shown in Figure 3) these differences were yet not statistically significant. Metabolic pathways for ATP muscle contraction & relaxation (Jupp. 1993). Yes, there are studies showing increases in testosterone and decreases in cortisol. Cinar et al. for example observed that "magnesium increases free and total testosterone values in sedentary and in athletes"(Cinar. 2011) within 4 weeks on 10mg/kg magnesium sulfate per body weight per day. Previous studies showed opposite effects for the stress hormone cortisol (Wilborn. 2004). In both cases, however, it is difficult to tell how practically relevant these hormonal changes actually are. If you asked me - probably less relevant than the effects on muscle contraction / relaxation (see Figure on the right) that is suspected to be responsible for the significant performance increases in the study at hand. One of the few parameters that did not improve with the magnesium supplement was thee the systolic blood pressure before the exercise tests. Compared to the placebo groups, the magnesium group did however experience a more rapid decline in blood pressure leading to 8.23 mmHg (6.17%) decreased SBP values after the 10k run. Similar reductions were observed for the diastolic blood pressure before and after the run (see Figure 4). For athletes that's probably not relevant, but for the average weekend warrior who may well be suffering from elevated blood pressure, this "side effect" may be highly welcome. Plasma an bone (primary axis) as well as red blood cell (2ndary axis(!)) Mg after 14 days of supplementation with identical amounts of magnesium in different organic and inorganic forms (Coudray. 2005) | learn more! So what? Well, it's hard to negate that - in this particular study - the provision of 500mg/day of extra magnesium yielded measurable and practically relevant results. This does not change the results of previous investigations with negative outcomes, though (DeHann. 1985; Weight. 1988; Ruddell. 1990; Terblanche. 1992; Weller. 1998). In view of the fact that magnesium supplements are cheap (Mg citrate is optimally obsorbed and there is no need to resort to expensive alternatives | just take it in 200mg alots with food to avoid diarrhea) and evidence of negative side effects of dosages in the range that was used in the study at hand is non-existent, it would still seem negligent not to make sure you get a little extra-magnesium from supplements | Comment on Facebook! De Haan, A., J. E. Van Doorn, and H. G. Westra. "Effects of potassium+ magnesium aspartate on muscle metabolism and force development during short intensive static exercise." International journal of sports medicine 6.1 (1985): 44-49. Jupp, RN. "How Magnesium Allows Muscle Relaxation" in "Human Physiology," L. Sherwood (ed.) West Publ. Co. Minneapolis (1989). Lukaski, Henry C. "Micronutrients (magnesium, zinc, and copper): are mineral supplements needed for athletes?." International Journal of Sport Nutrition 5 (1995): S74-S74. Pitkin, Luke William. 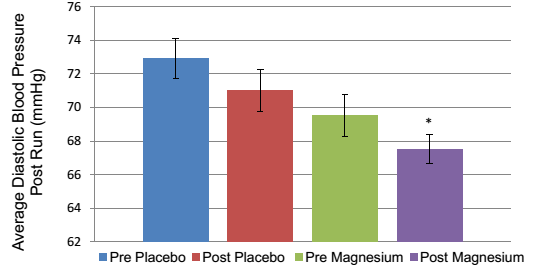 "The effect of magnesium supplementation on high and low dietary magnesium intake on resting, during and recovering from exercise on blood pressure, performance and serum levels of magnesium (Mg2+)." (2014). Rüddel, H., C. Werner, and H. Ising. "Impact of magnesium supplementation on performance data in young swimmers." Magnesium research: official organ of the International Society for the Development of Research on Magnesium 3.2 (1990): 103-107. Schwellnus, Martin P., Nichola Drew, and Malcolm Collins. "Muscle cramping in athletes—risk factors, clinical assessment, and management." Clinics in sports medicine 27.1 (2008): 183-194. Terblanche, Sonja, et al. "Failure of magnesium supplementation to influence marathon running performance or recovery in magnesium-replete subjects." International journal of sport nutrition 2.2 (1992): 154-164. Wacker, W. E. (1980). Magnesium and man. Harvard University Press. Weight, Lindsay M., Kathryn H. Myburgh, and Timothy D. Noakes. "Vitamin and mineral supplementation: effect on the running performance of trained athletes." The American journal of clinical nutrition 47.2 (1988): 192-195. Weller,Ellen, et al. "Lack of effect of oral Mg-supplementation on Mg in serum, blood cells, and calf muscle." Medicine and science in sports and exercise 30.11 (1998): 1584-1591. Wilborn, Colin D., et al. "Effects of zinc magnesium aspartate (ZMA) supplementation on training adaptations and markers of anabolism and catabolism." J Int Soc Sports Nutr 1.2 (2004): 12-20.